As you can see we have painted a wide variety of Labrador paintings. 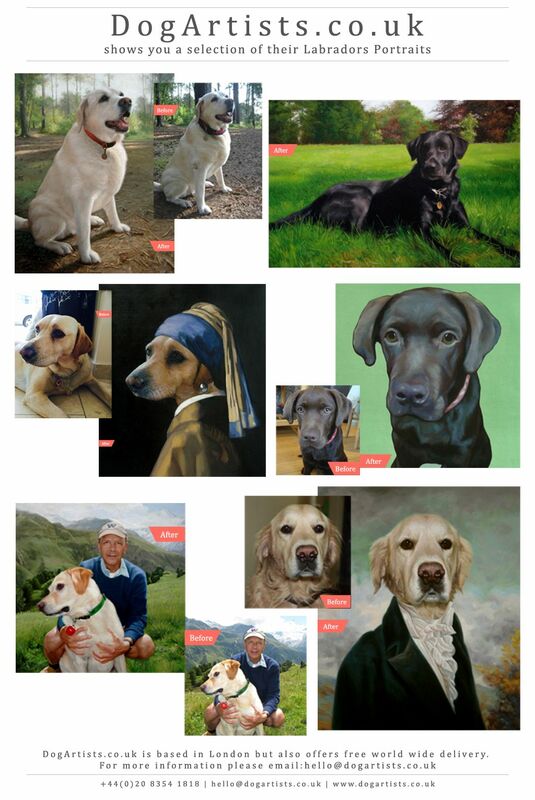 On the first line of the Labrador gallery, we have two Labradors painted as The Count of Monte Cristo and one as Vermeer’s Girl with a Pearl Earring. Having your dog painted in uniform or period costume is extremly popular as it allows you to choose the attire that best reflects your Labrador’s character. Alternatively, like Millie painted as Vermeer’s Girl with a Pearl Earring is that you can choose your most favourite painting to have your dog painted into. The middle and last line of oil paintings are classic Labrador portraits. The Pa and Pungo portrait is painted in a Realist style, meaning that the portrait is painted exactly like the photo provided and is extremely life-like. Saffy is painted with what we term a ‘studio background’ useful if you don’t like the background of the photo you’ve provided plus we can use colours to bring out the tones of your Labrador. Lastly, Monty the Labrador is painted with a ‘block colour’ background, we feel this is quite a modern style! All of these Labrador paintings are hand-painted using premium Winsor & Newton oils onto a high quality duck cotton canvas. Oils do take a while to dry and as we pride ourselves on painting you high quality portraits that you will be proud to display and that will stand the test of time we will not rush on the quality of your portrait. We therefore ask that you allow between 4 – 6 weeks from commissioning your portrait to receiving it. If you are ordering a dog portrait as a gift for a special occassion and are on a tight timeframe we can send you personalised gift vouchers.